$50 – $100 for a single click!! Am I kidding? Or am I going crazy? No, I am not kidding, neither am I crazy. So, how does one can earn $50 – $100 for a single click on AdSense? That’s exactly what you are going to read here. But before we dive into the core of this post, let me ask you one thing. Do you have an AdSense account? If not, don’t go for it right away. You should check these things to consider before applying for AdSense. 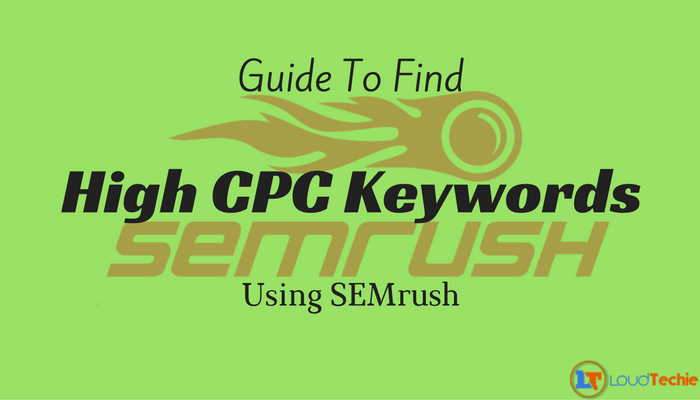 How to find high CPC Keywords using SEMrush? As you might have guessed, we need SEMRush here. We will be stealing the keywords of competitors using SEMRush. I have divided this tutorial into different steps for your convenience. Step 1: You have to collect the URLs of your competitors first. Just have a Google search. If blogging is your niche, go for make money blogging or any other popular keywords. You have to pick those sites with less authority because it is hard to beat sites like quicksprout.com. Step 2: Open a spreadsheet or notepad to paste the URLs there. You can save the file to expand the list for future use. Step 3: Now, you have to visit SEMRush. Don’t worry! You can get your hands on a free trial account for 14 days. Just create one. Step 4: Can’t you see a field there? Enter a domain of your competitor there and press Enter. Have a look at the organic keywords section. Click on Full Report. 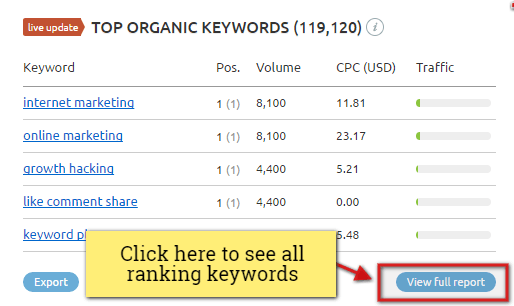 Step 5: You will get a list of all keywords your competitor ranking. A click on the CPC sorts the list in the decreasing order of CPC. You must give preference to long tail keywords. Step 6: Open Notepad or a new spreadsheet to insert chosen keywords. You can specify CPC if you want. Step 7: As you piled up enough keywords, you can start writing search-engine friendly articles. Don’t go for keyword stuffing or anything blackhat. You know what? AdSense needs organic traffic more than you imagine. So, read how to increase traffic to your blog. AdSense team is so strict that you can’t get away with any fraudster activities. So, stay away from blackhat activities to prevent AdSense ban. Do you think AdSense is the only way to earn money online? No, you are wrong! There are plenty of ways to make money online without AdSense. In case your AdSense account gets banned, you can check these AdSense alternatives. What if you want to get competitor keywords after 14 days trial period? Create a new account with another email address. Or, you can go to com/siteinfo/domain.com (replace domain.com) to find top five keywords. But without CPC info, though! 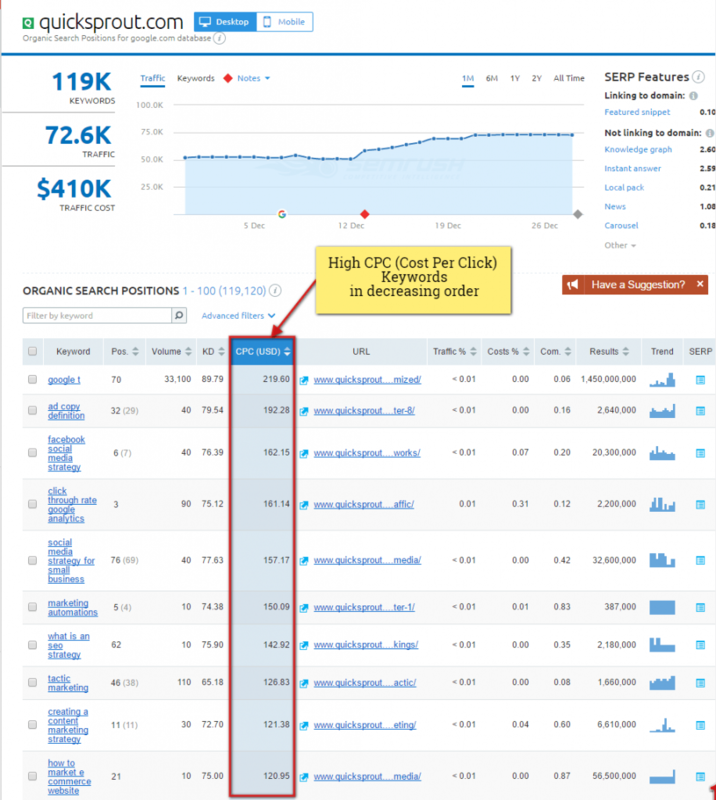 I hope you know how to find high CPC keywords using SEMRush now. There are thousands of golden keywords waiting for you. Create an account and explore them NOW. You have written on important topic which is very big issue for SEO specialist they want to know about SEMrush clearly. Thanks for solving our lots of points. SEMrush is clearly the best tool out there for professionals. It can be very helpful if one can learn to use it properly. Good to know it is helping you out. Keep visiting for more updates on SEMrush.